Here’s the itinerary I’ve planned for Don and the family. The Drapers fly to Miami, rent a car and check into the ultra-chic Fontainebleu on Maimi Beach. If the Fontainebleu is hip enough for James Bond in “Goldfinger” (1964) it’s hip enough for Don and the gang. After an afternoon on the beach and in the pool, a hotel babysitter would be summoned so Don and Megan can dine and dance in the elegant nightclubs on the strip. Next the Draper’s would hit Highway US 1 and A1A heading up Florida’s east coast toward Cape Canaveral, stopping along the way to buy cigarettes, Coca-Colas and Nehis at roadside attractions where they might see talking Minah birds, wallowing alligators, slithering snakes, Florida black bears or black panthers in cages alongside the gas pumps. At Cape Canaveral they’ll check into a beachside motel where the kids will swim in a pool that has an underwater window into the bar where they will wave at their Daddy while he downs a quick old-fashioned before heading poolside to rejoin Megan and take baby Gene for a dip. The next morning they’ll take in a rocket launch beachside and head inland to visit Cypress Gardens, made famous by swimming movie star Esther Williams. Southern belles in hooped skirts will greet them, and the Drapers will enjoy strolling through the gardens with dripping ice cream cones, and then watch the exciting water ski show. By now their pasty New York complexions have burned to an uncomfortable shade of lobster, and they’ve resorted to wearing straw hats and zinc oxide on their noses. Thank goodness the famous glass-bottomed boats at Silver Springs have canopies and the oaks surrounding the springs are shady, dripping Spanish Moss. After a day cooling off in the shady springs, Don motors the family back to the coast. From their beachside motel they’ll visit the famous Daytona Beach boardwalk at night where Don will have his future revealed by the fortune-telling chicken. The whole family takes a ride on the giant ferris wheel, where Bobby will toss his cookies from the very top. For the enrichment of the kids, a visit to both St. Augustine and Marineland is a must. 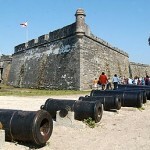 While standing on the ramparts of the Castillo De San Marcos, Don gazes at the masts of moored sailing yachts andwonders what it would be like to sail to the keys and do some nice quiet fishing. But for now, there’s a horse drawn carriage ride through the old city and cotton candy to be dribbled down the kid’s clothes. As their return flight lands at La Guardia, Don is counting the minutes until he can return to work.